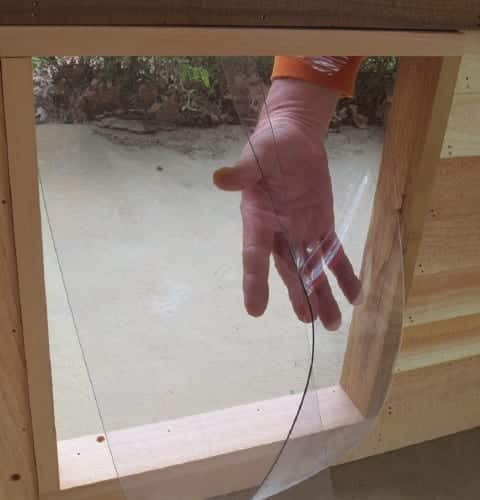 Blythe Wood Works installs a clear vinyl flap door on every dog and cat house we manufacture. These quality doors are available in sizes that fit our pet houses. Vinyl doors make it very easy for your pet to enter and exit safely. In the winter, these doors will significantly aid in holding heat. Blythe Wood Works installs a clear vinyl flap door on every dog and cat house we manufacture. These quality .080 vinyl doors are available in four standard sizes, from a small 6″ round to the 18 x 26 Goliath size. Each door has a top mount support bracket and is predrilled for the screws (included). Our doors make it very easy for your pet to enter and exit safely. In the winter, these doors will significantly aid in holding heat. Many customers remove the door during the summer months for greater ventilation, then reinstall in the fall for the winter. We can manufacture any size door needed, but below is the list of door sizes we stock, the corresponding house it fits, and the price (delivered). The flap doors last a fairly long time but end up tearing in the middle of the flaps on the inside. Weather here can be pretty extreme so likely that contributes to the problem.